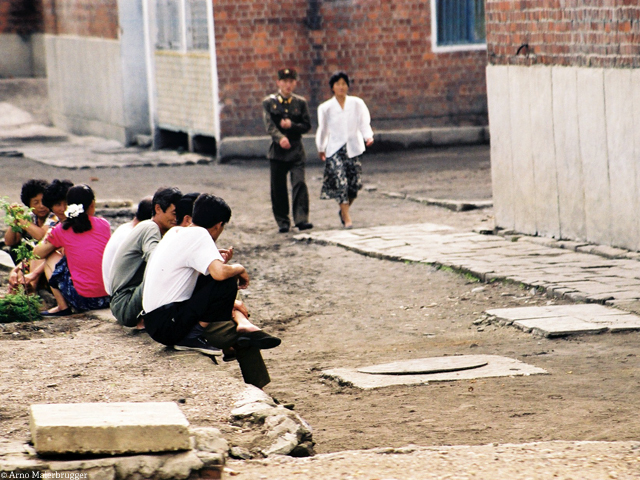 With political tensions between North and South Korea erupting again, it’s time to look behind the Iron Curtain. 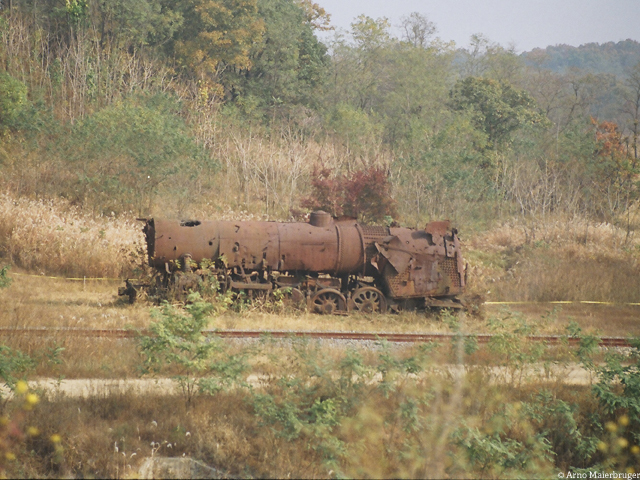 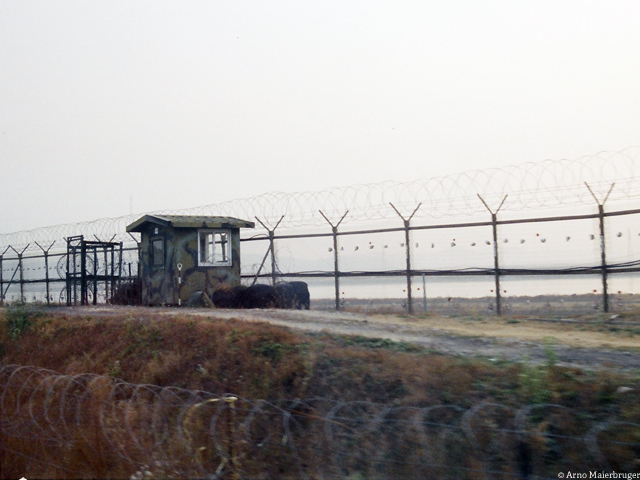 Arno Maierbrugger crossed the Demilitarised Zone (DMZ) between the countries. 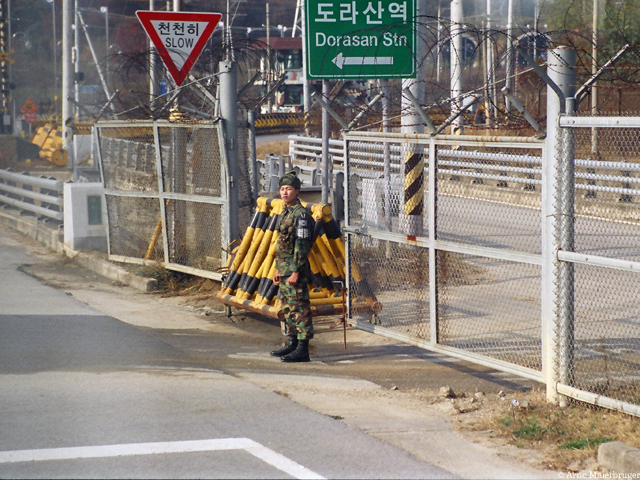 The Demilitarised Zone is a strip of land running across the Korean Peninsula that serves as a buffer zone between North and South Korea, running along the 38th parallel north at a length of 250 kilometers and a width of around 4 kilometers. 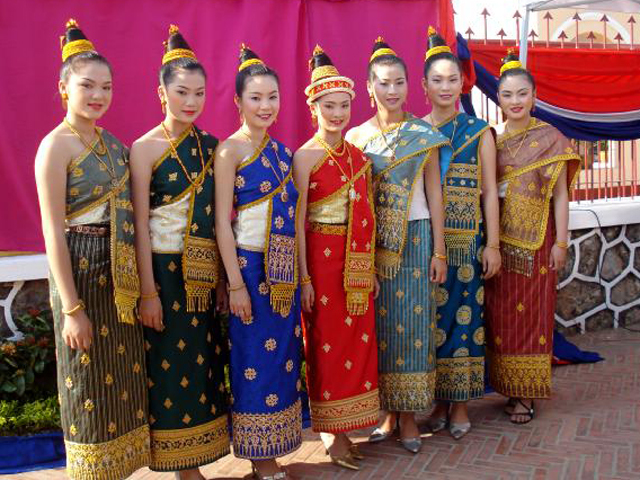 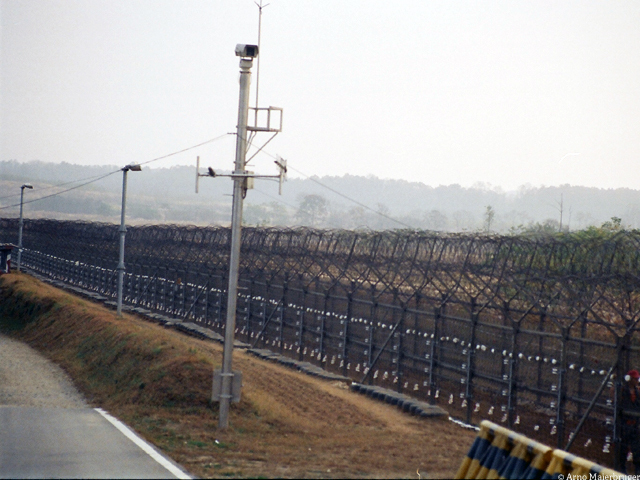 It is the most heavily militarised border zone in the world. 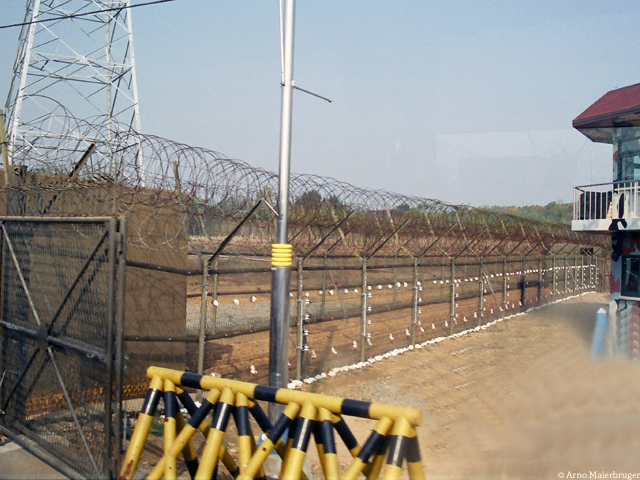 Fences are electrified and the area is full of landmines, there are anti-tank barriers, flag poles and military posts on both sides. 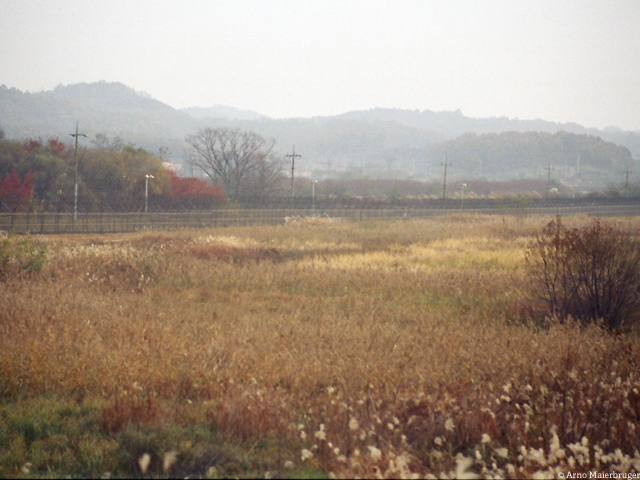 The strip itself, closed off and being a deadly place for humans, making habitation impossible since its creation in 1953, has developed into a nature reserve for rare leopards, tigers, bears and cranes and a varied biodiversity that has prompted some ecologists to propose turning the DMZ into a UN World Heritage Site. 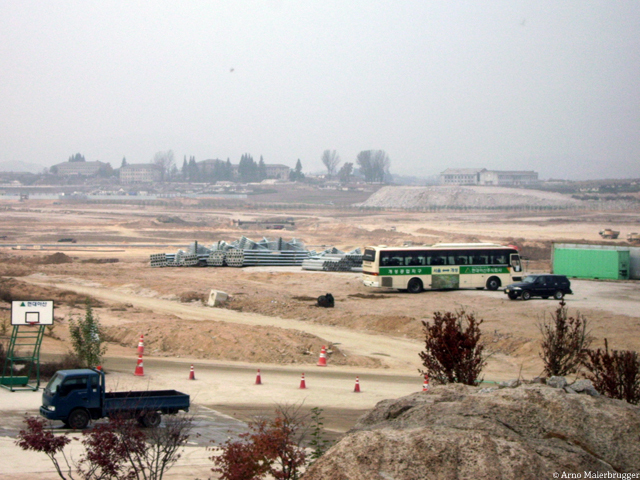 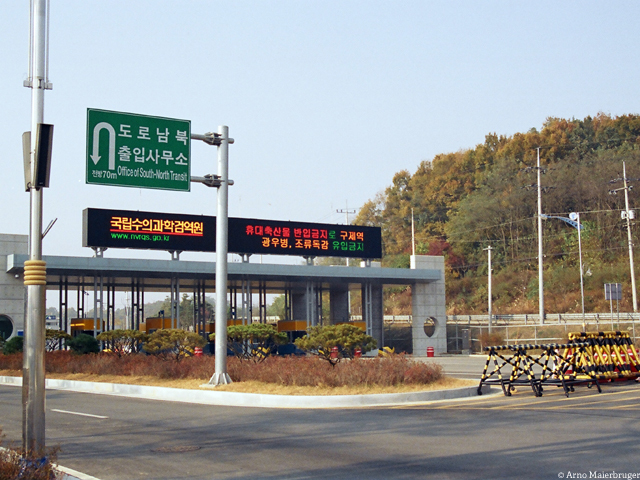 There are just two border crossings that are occasionally open when the political situation is more relaxed: The Dorasan-Kaesong crossing in the west which gives the South access to the Kaesong Industrial Zone in the North, and the Jejin-Goseong border crossing on the east coast that allows tourists to visit the Kumgangsan mountain area in the north, commonly referred to as North Korea’s ‘holiday gulag’. 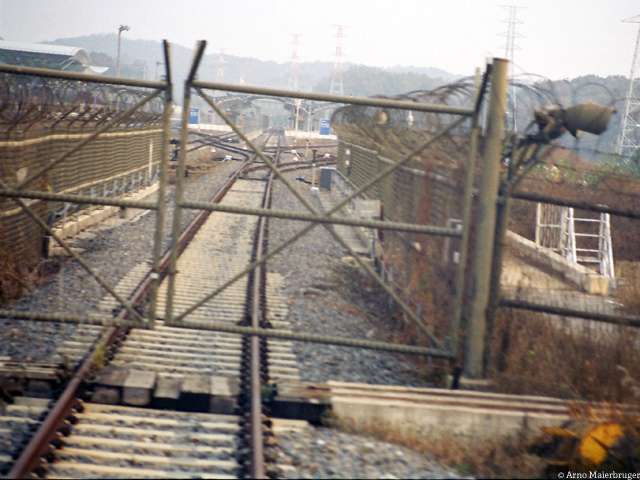 Another crossing point in Panmunjon, where the building in which the 1953 Korean Armistice Agreement that paused the Korean War was signed, can just be visited from both sides but not crossed except from very rare exemptions over the so-called Bridge Of No Return. 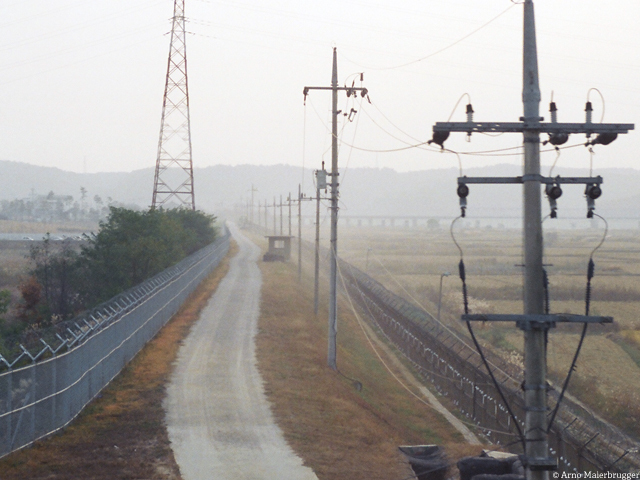 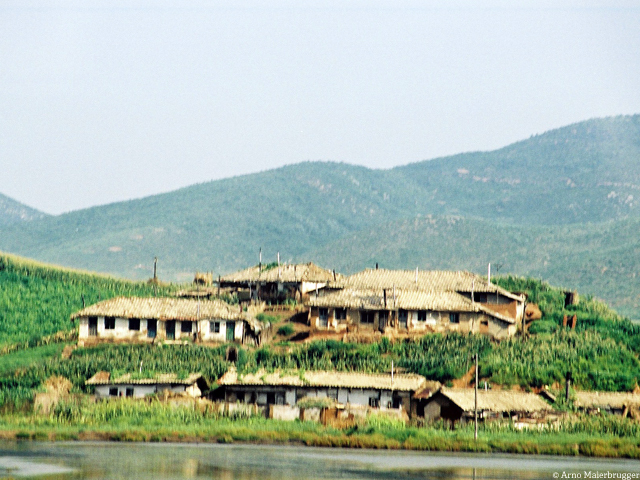 Illegal crossing of the DMZ implicates a sentence of 12 years of hard labour in one of the North Korean gulags when caught, regardless whether the offender is North Korean or a foreigner. 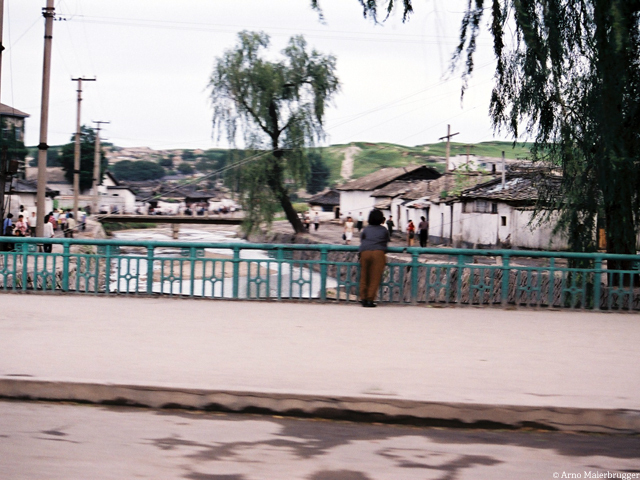 Below a photoblog from the Dorasan-Kaesong crossing. 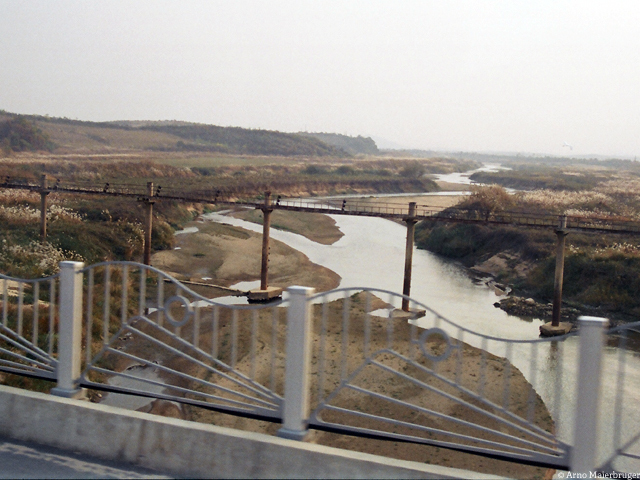 Crossing the Imjin River, which flows from North to South Korea through the DMZ and joins the Han River downstream of Seoul.The poles in the background seem to carry power or telecom lines. 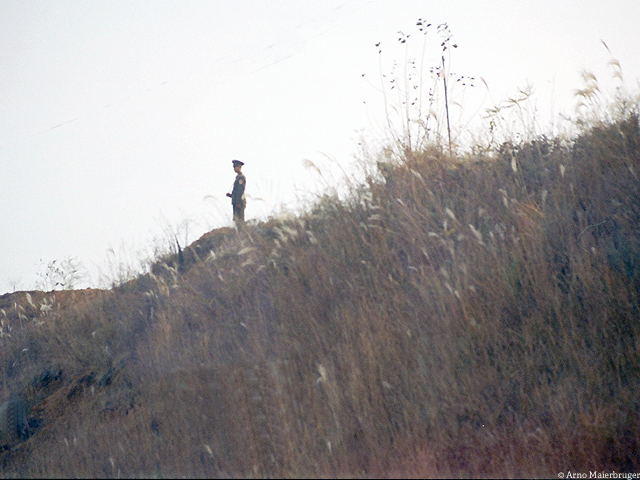 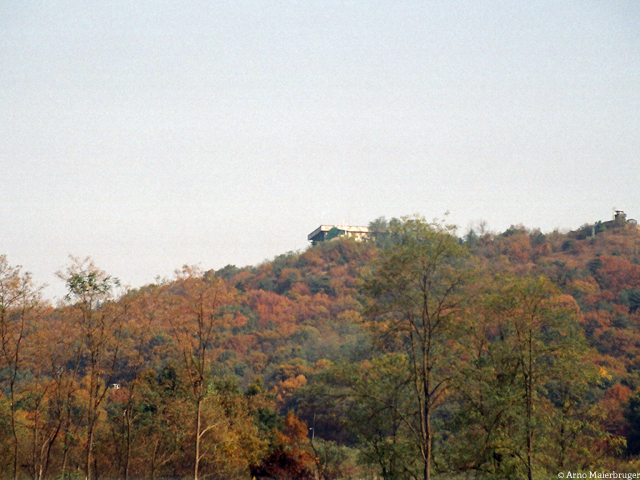 North Korean guard on a hill. 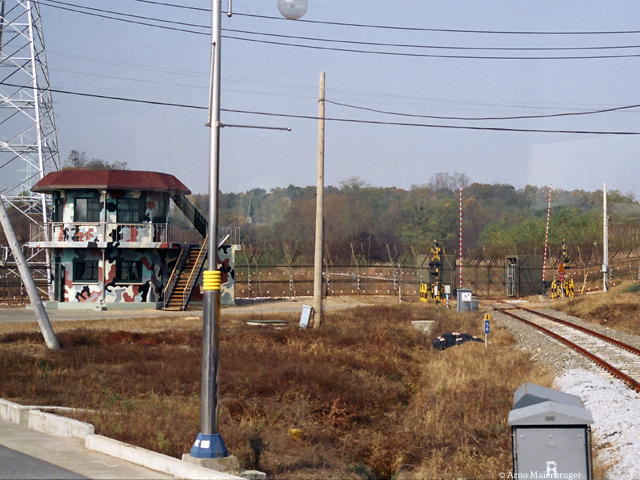 Off limits for humans since 1953, the DMZ has developed into a natural reserve for rare species of animals and plants. 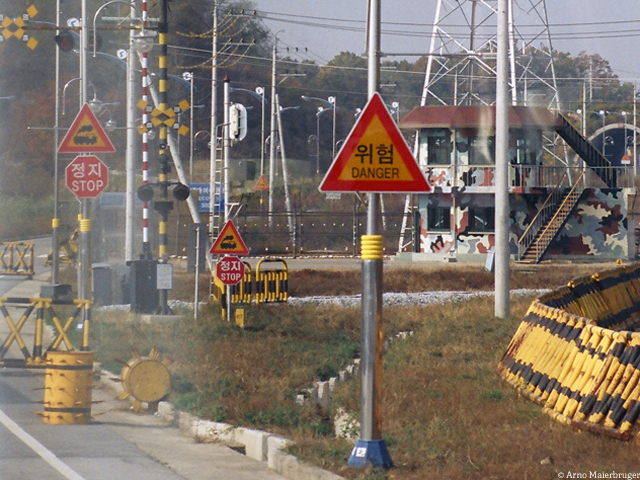 Road for border patrols. 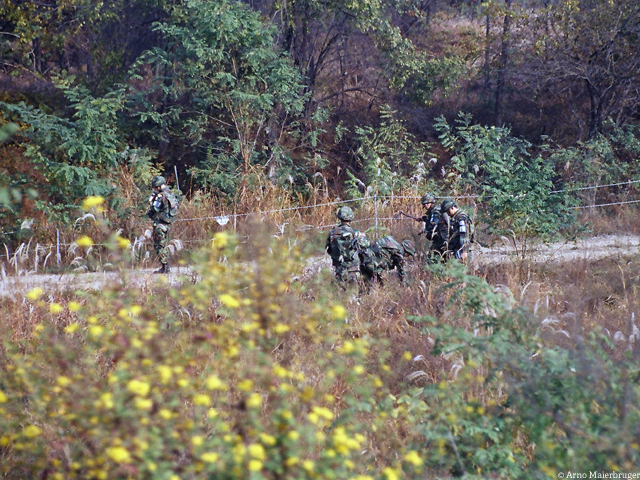 The area is full of landmines. 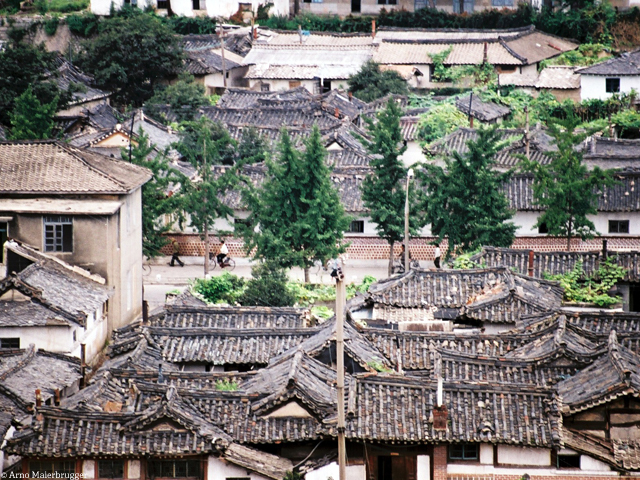 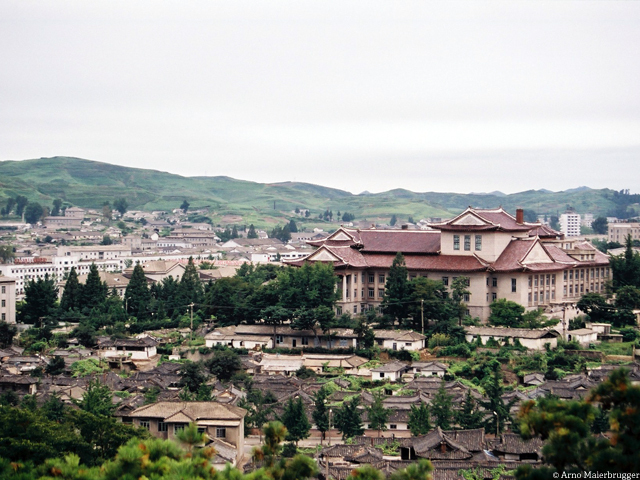 Kaesong boasts one of the few relatively well maintained old town quarters in North Korea. 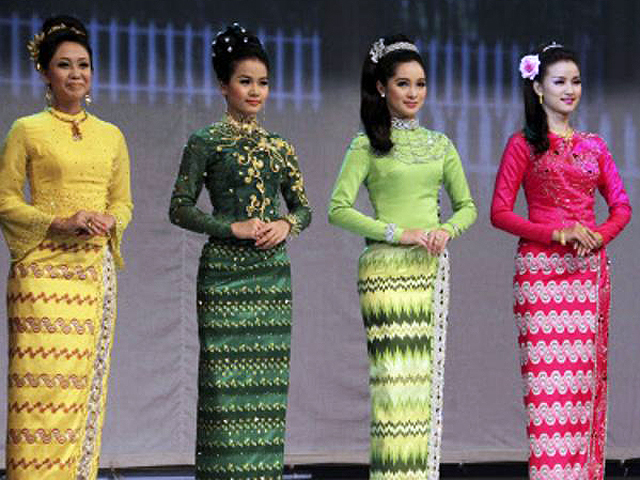 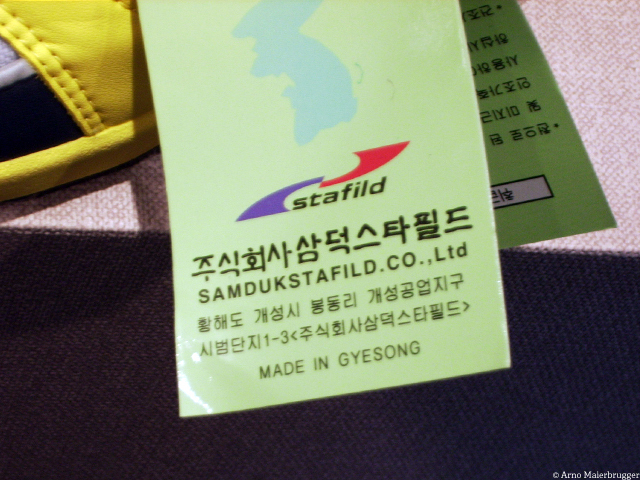 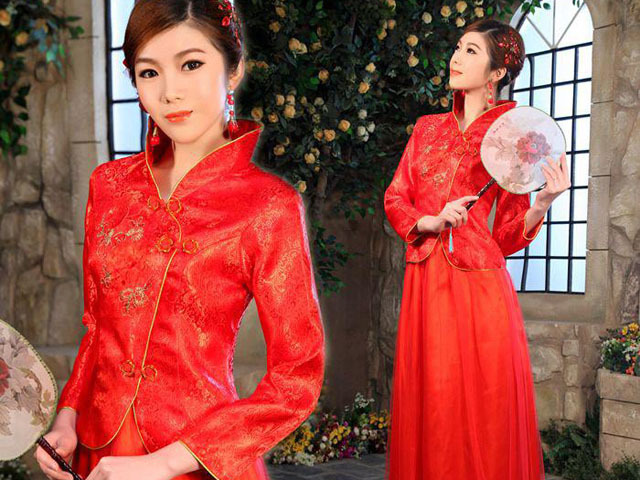 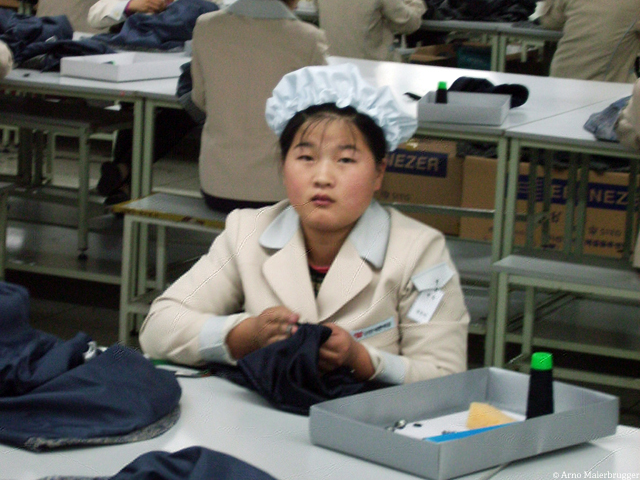 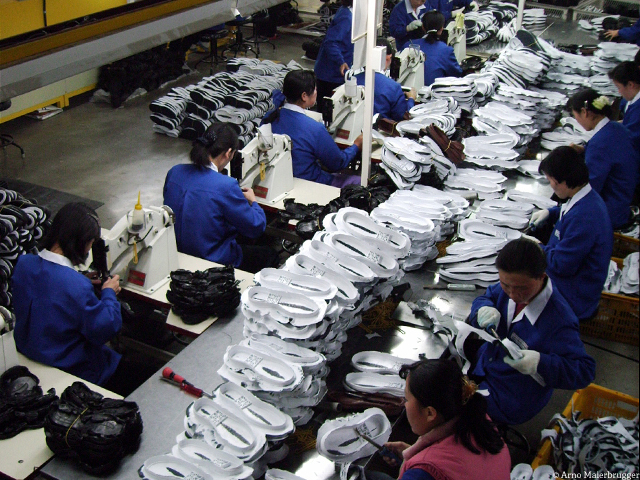 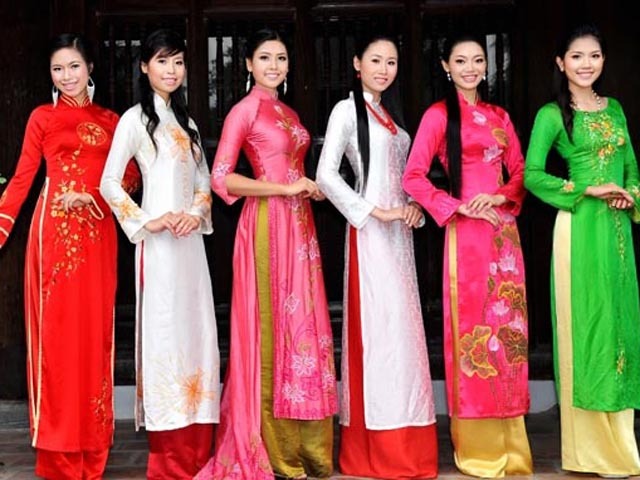 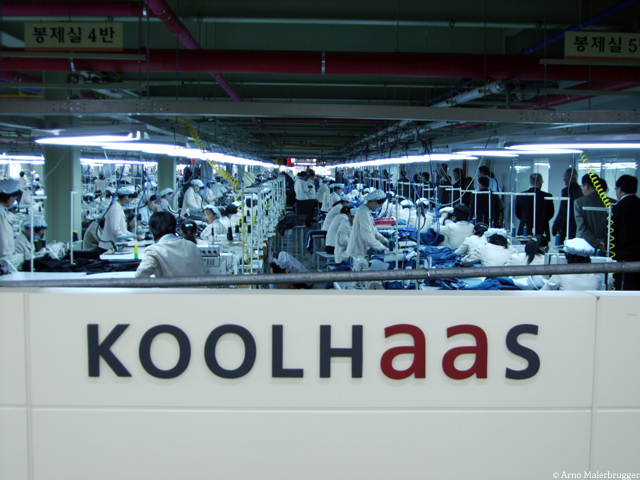 Casual fashion label Koolhaas, made in North Korea by South Korean apparel maker Sinhwon Co. 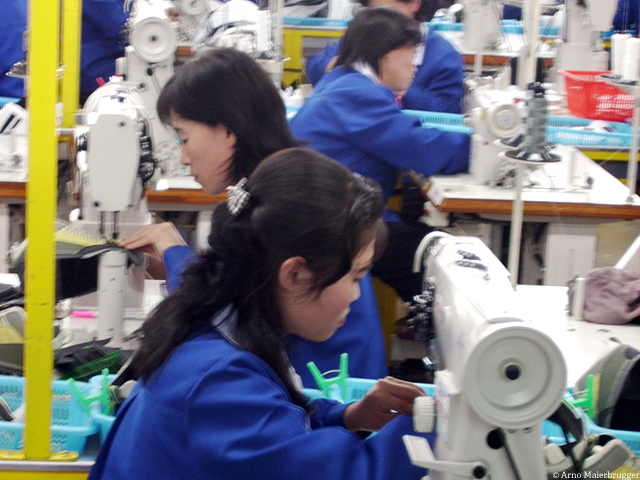 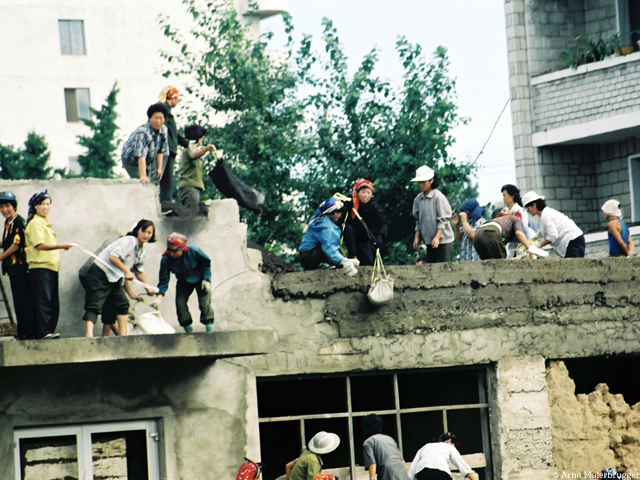 The official monthly salary is $57.50, of which $30 go to the Workers’ Party and $17.50 are spent on insurance and other costs, North Korean workers at the complex are left with $10 a month.